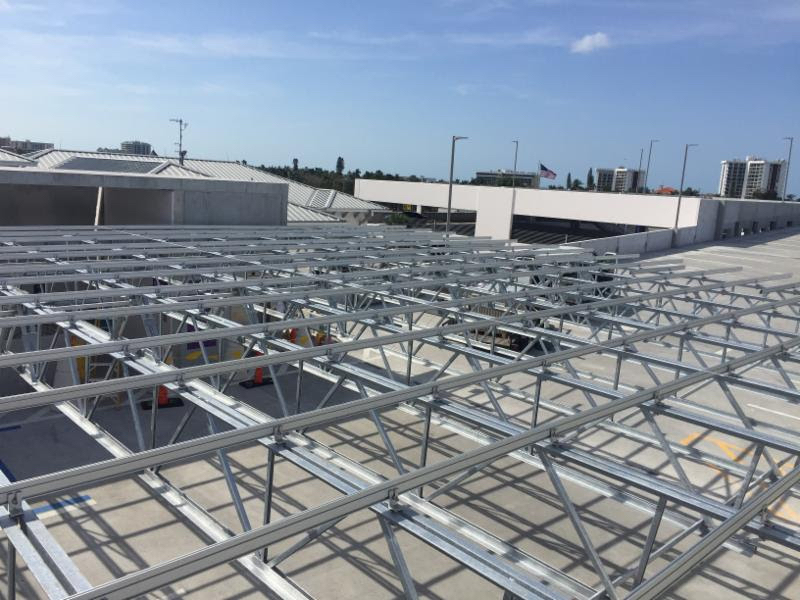 The installation of solar panels atop the new St. Armands parking garage is expected to begin this week, Sarasota City Manager Tom Barwin announced in his March 15 newsletter. Preparations for the project started last week, he noted. “Energy produced by these panels will be used by the building to offset the amount of electricity that is needed to be purchased from Florida Power & Light [Co.],” Barwin pointed out. Solar power will be used for the lights, elevators and the garage’s multiple electric-vehicle charging stations, he added. City staff estimates the 98 solar panels will save more than $5,000 per year in electricity costs, Barwin continued. The system is expected to produce more than 53,000 kilowatt-hours a year. “That’s the equivalent of preventing the greenhouse gas emissions from 40,973 pounds of coal burned, 4,200 gallons of gasoline consumed or 91,600 miles driven by an average passenger vehicle,” Barwin wrote. “Whenever the sun is shining, the four-story garage will be partly powered via this automatic process,” he added. “This initiative supports the City’s goal of transitioning all of our facilities to 100 percent renewable, zero-emission energy by 2030, as outlined in our Ready for 100 plan,” Barwin pointed out.